some of the most enviable vistas imaginable in Gozo ….. Quietly tucked away down an alley in a quiet area of Xaghra, Panorama offers a warm welcome to guests looking for some peaceful rejuvenation and time out. With luxurious interiors and boasting an indoor pool, wine cellar, cinema room, spacious gardens, wood burning oven and an outdoor pool this stunning rural retreat truly does have it all. 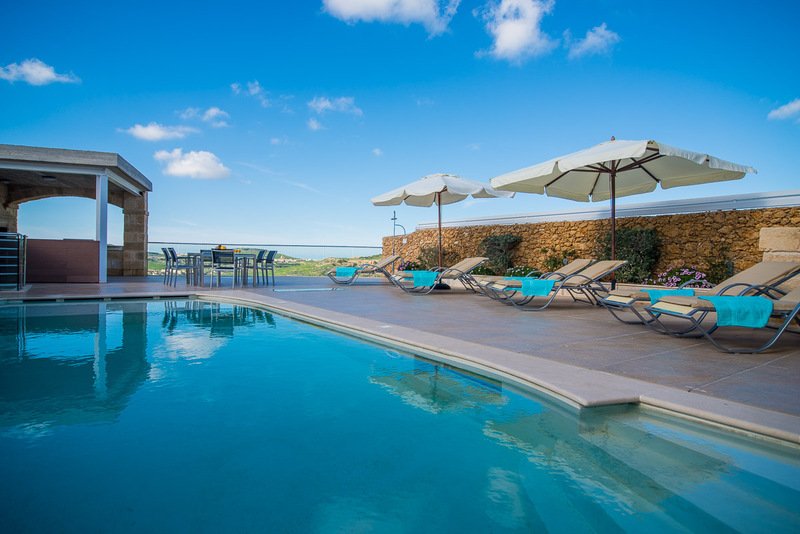 Entering this fully air conditioned and floor heated property; one finds two queen size bedrooms one of which is en-suit, a separate bathroom and an open plan kitchen/dining/living area with spectacular views of the Gozitan countryside that will take your breath away. The kitchen is a chef’s delight equipped with high end appliances including a dish washer and washing machine in a separate laundry room. A 50″ high resolution TV embraces the living room area and is sure to keep you, your family and friends entertained. Sliding doors open to the outdoor area which includes a good size swimming pool (3.7m x 7.5m x 1.3m), surrounded by a large deck area (155m2) complete with a traditional wood oven and a gas BBQ to experience Gozitan cuisine at its best, with al fresco dining area, which is sure to become your favorite spot to sit and catch the day’s sun rays. We invite you to head downstairs to the entertainment room including a bar, a 50″ LED TV and a large sofa. There is also an indoor pool (2.7m x 9.8m x 1.1m) built in natural rock surroundings which is also heated in the winter months. For the wine connoisseurs Panorama also offers a wine cellar where you can enjoy your favorite bottle of wine with friends and family. Here one will also find a twin bedroom with an adjacent bathroom and a cinema room with a 2m screen complete with a wall folding bed and a bathroom for extra comfort. Leading down a stone staircase one finds the garden terrace overlooking a mature garden, which boasts fresh herbs, relaxing surrounds and old carob and olive trees. The property also boosts a two car underground garage for the ultimate convenience. * Prices are per night for 6 persons. Extra person €15 each.